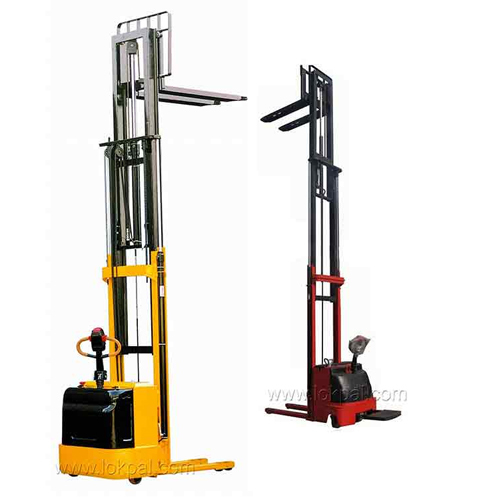 Manual Hydraulic Stacker can be used for lifting pallets with better stability, preferred when pallets have to be lifted to different heights. Loading /unloading purpose, stacking pallets in racks, loading/ unloading dies on machines. (Kg) Max. Fork HT. "A"
(mm) Mast HT. Max "C"
Adjustable Fork Stacker can be used with closed pallets, and wider pallets for better stability, preferred when many different sizes of pallets and load have to be handled. All stackers can be fitted with An electric Hydraulic (EH) Power Pack (3 Phase 440 volts) with a Manual standby pump or a Battery hydraulic (BH) power Pack (12 VDC). 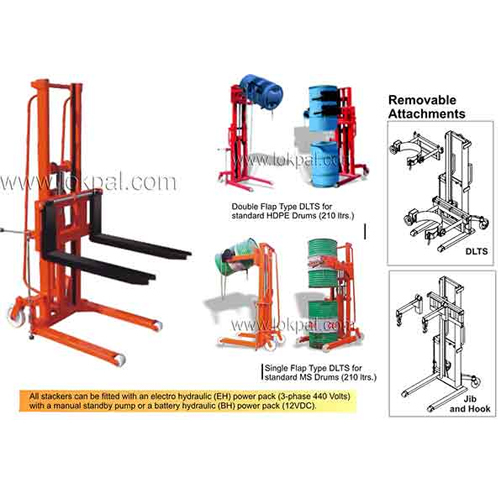 Manual Stacker Ideal low cost solution for shifting, stacking, loading, unloading goods on to racks, trucks. Die and mould loading and unloading in capacity of 1000, 1500, 2000kg. 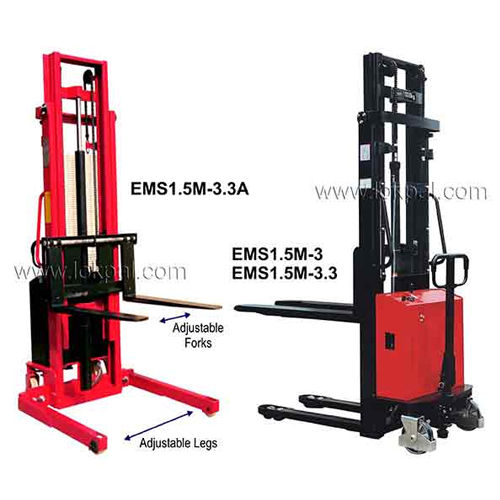 We are engaged in manufacturing a quality product known as Semi Electric Stacker. This is mainly used in factories and warehouses, required for transferring the goods from one place to another. Our adroit professionals use premium grade materials and modern technology for the manufacturing process. It has Rubber coated handle. 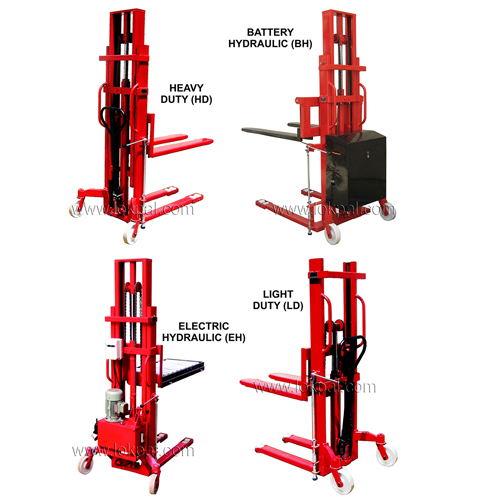 Full Electric Stacker offers smooth transport and rack operation in distinct industries. This has adjustable driver’s space that allows the operator to have safe operation. 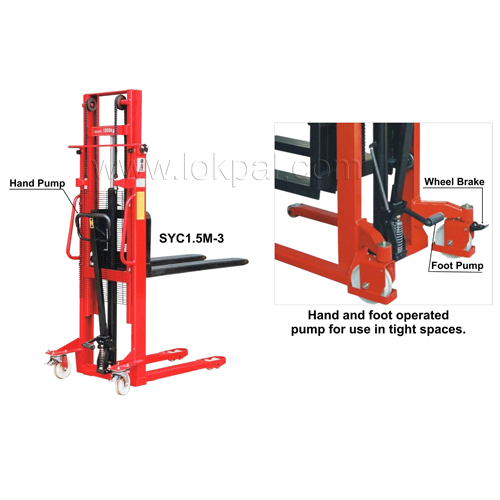 It has ergonomic control for maximum comfort while loading or unloading the materials. Compact design, strong & robust steel construction. Top Quality Hydraulic Pump & Cylinder.